Ravens (-3) over BILLS. Last week, the Jets were called for 20 penalties for 168 yards. And they still won, because fortunately for them, the Bills allowed 513 yards to Geno Smith, Stone Hands Hill, Semi-Hobbled Santonio Holmes, and Bilal Powell. Bengals (-3.5) over BROWNS. As much as my fantasy team thanks Brian Hoyer for only caring about Jordan Cameron and Josh Gordon (though I benched both of them while they got 30.6 and 32.8 points respectively. Don't worry, I still won. ), the Bengals defense is a lot better than that of the Vikings. Coming off of a great win against Green Bay, people may finally be taking this team seriously. As well they should. P.S. Brandon Weeden pretty much lost his job as soon as the clock hit 0:00 on Sunday. LIONS (-2) over Bears. Pure home team pick here. I think the Bears are better, and are in great position to win this division. But the Lions are pretty good as well, so the home field advantage should propel them to a tight victory. CHIEFS (-4) over Giants. Who the hell makes the lines for the Giants nowadays...a drunken Eli Manning? How much money are John Mara and Steve Tisch paying the oddsmakers to make it look like their team is decent. Did anyone watch them last week? Or in Week 2? Or in Week 1 (they almost won, but that's more of a reflection on the Cowboys)? Plain and simple, this isn't a good football team. On the other hand, the Chiefs are just that. The David Wilson train might just be scrap metal by the end of this matchup. Steelers (-2.5) over "VIKINGS" (Game will be played in London). Neither team is particularly good, but Matt Cassel is starting for the Vikings. While he may be an improvement over Christian Ponder, that just shows their desperation. Start warming up McLeod Bethel-Thompson! Remember when I wrote this about Ponder? Well I haven't done my Weekly Awards in almost a year now, but let's just say I backed off that statement very quickly. Cardinals (+2.5) over BUCCANEERS. Damn...After all the faith that I continually showed in Josh Freeman, he decided to begin the season with three straight stink bombs, causing Greg Schiano to bench him in favor of Mike Glennon. I kind of liked Glennon during this year's draft, and I was rooting for the Jets to grab him in either the second or third round (assuming that Geno Smith wasn't available). He's quite the polarizing player, as people from Bill Barnwell to internet writers all around question his ability. As much as I may have liked his talent, he's probably going to get replaced by a draft pick sooner rather than later. He's especially not doing anything in this game. Overall, the Bucs are better, but, and I can't believe I'm saying this, Carson Palmer is the better quarterback. 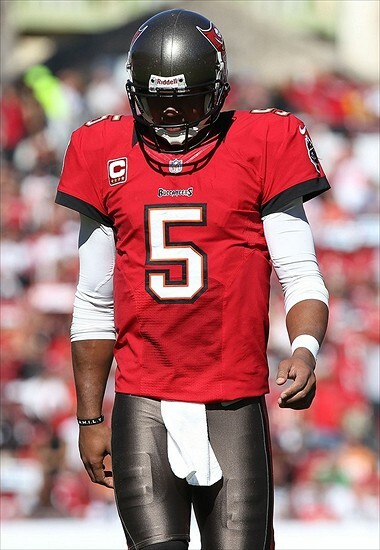 Hold on, I'm still crying about Josh Freeman. I've never seen a quarterback be so good and turn to crap so quickly. He had so much talent, but I don't know if that is even still there. Good luck Josh, I really hope you re-discover that amazing 2010 form somewhere else. Maybe Geno Smith fails and you get your opportunity with....the Jets. In that case, I demand you to wear the same underwear you wore during that season. To eat the same food. To get the same haircut. Retrace your steps. Take the same breaths at the same times. Do whatever you can, because that was a fun year to be a fan of yours. I hate to see it fall to pieces like this. Colts (-7.5) over JAGUARS. I'm not convinced by the Colts just yet. They have my eyebrow raised after their dominating win on Sunday in San Fran, but it very well could be an anomaly. I just can't trust their defense yet. But I can in this game! Gabbert is back baby! Seahawks (-2) over TEXANS. The Seahawks are a better team. The Texans don't look too hot right now. TITANS (-3.5) over Jets. This is an interesting one. The Titans are probably a better team than my Jets, but it's close. The winner of this game might have actually put themselves firmly in the conversation for a Wild Card berth. This will end up being an important game due to the tiebreaker. Unfortunately for my Jets, the game is in Tennessee. By the way, after last week, Jake Locker is finally getting noticed. I've always thought that he was pretty good, and he may just be rounding into form. BRONCOS (-11) over Eagles. The Eagles can't defend anything. Peyton Manning is a bit better than "anything." Washington Professional Football Team (-3.5) over RAIDERS. Washington wasn't terrible against the Lions, so I upgraded them back to their original state as a professional team. But if they lose to Terrelle Pryor and the Raiders... They can't be that bad can they? I know the defense is absolutely putrid, but at least the offense should save them against this sad bunch, right? Cowboys (-1) over CHARGERS. One of the more confusing games of the week, the line dropped to 1, so I'm going to take the 'Boys here. I don't feel great about it, but I have no idea what to make of Philip Rovers. Is he good again? Just know that the Cowboys are easily the best team in their division. This isn't saying much, but they very well could sweep that division. It's brutal. FALCONS (-2.5) over Patriots. Okay, this is another home team pick. Both teams have their issues, and they probably won't be nearly as much of a threat in the playoffs as we originally thought before the season. Well for the Patriots, as long as Amendola and Vereen are back soon, they'll be fine (as will my fantasy team). Dolphins (+7) over SAINTS. Nope. Not buying into this Saints thing yet. Sorry N'awlins. In fact...UPSET ALERT. Come at me Who Dat Nation.